Many people believe that Happily-ever-after only happens in fairy tales, or movies for that matter. But many others who are in long term successful marital relationships beg to differ. 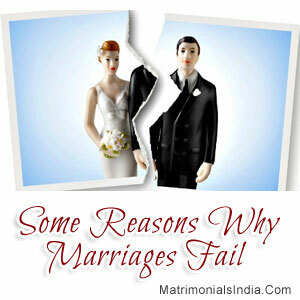 Successful marriages do exist and happily married couples are not just a fable. Marriage counselors have in fact identified a set of some common reasons that are responsible for the failure of most relationships. Inability To Resolve Conflicts : Many couples fail to realize that conflicts are an inevitable part of a married life. They become discouraged at the first signs of conflict. The success of a marital relationship depends on how well the couple resolves the conflict. Problem solving pattern in a married couple is a sign of a successful relationship. Constant Criticism : This is another point that has been found common in most failed marriages. Constant criticism either chips away at the other partner's self image or makes him/her indifferent. Constant criticism also breeds anger. If this anger remains unresolved for long, then it can lead to contempt. Contempt can damage the marital relationship in no time at all & make it crumble. Inability To Accept & Appreciate Each Other : One of the foremost reasons for the failure of marriages is the inability of partners to accept that they are both different individuals &, as such, it becomes difficult for them to accept each other's differences. Agreeing on every point is impossible but it is always possible to respect each othe's point of view & appreciate the good points in a relationship. Unforgiving Nature : If either of the partners refuses to let go of mistakes made by the other, the situation can become quite sticky. Everybody makes mistakes in a marital relationship how you handle the situation & learn from those mistakes is what matters above all. A popular quote by Ruth Bell Graham states this aptly - "A good marriage is the union of two good forgivers." By working on these problems, a couple experiencing marital troubles can ensure that their Happily-ever-after does not come to an abrupt end, rather stretches on for a lifetime.